Karachi / Seoul, January 28, 2018 — LG Electronics (LG) is showcased its compelling vision for total clothing care with the revolutionary Styler system at CES 2019. Headlining the lineup will be the new LG Styler Black Tinted Mirror Glass Door, a CES 2019 Innovation Award winner. LG will also demonstrate captivating large capacity concept models for the future and a Smart Mirror with AI service for an entirely new virtual fashion experience. The premium LG Styler Black Tinted Mirror Glass Door brings functionality and elegance to the home with a refined, modern design and the ability to keep clothes hygienically clean and looking their very best. The new tinted black-glass door exudes sophistication while the unit goes about effortlessly and conveniently refreshing up to four garments – including a pair of pants in the door – simultaneously. The inclusion of Smart Diagnosis™ and SmartThinQ™ offers users the benefit of fast, accurate support and the ability to tap into the Google Assistant with only one’s voice. At the core of the Styler is LG’s TrueSteam™ technology which eliminates over 99.9 percent of the germs and bacteria found in clothing to keep one’s wardrobe hygienically clean*. Clothes placed on the moving shake out wrinkles and unpleasant odors while Gentle Dry removes moisture quickly and thoroughly. Heat Pump Drying reduces energy consumption by recycling heat from the hot, moist air inside the Styler and Pants Crease Care ensures a neat, tidy look by eliminating wrinkles and creating a crisp crease-line without an iron. 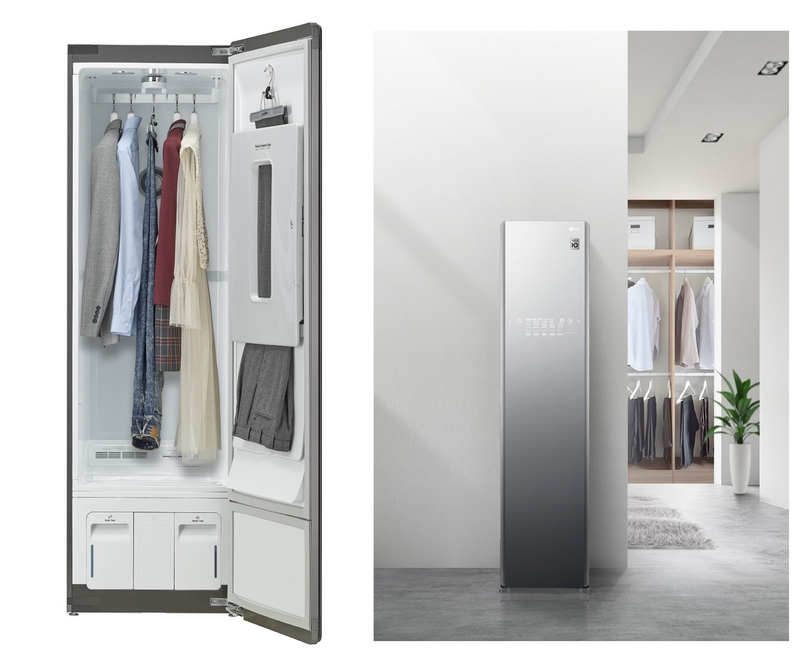 In addition to the new Styler, visitors to CES 2019 will be able to experience LG’s total clothing solution of tomorrow. Designed for bigger families, the large capacity Styler is an expanded version of the Styler Black Tinted Mirror Glass Door that can accommodate five garments on moving hangers (including full-length coats) as well as a pair of pants in the door. In addition to the Styler of tomorrow, LG is giving the public a look at the bedroom of the future with its Smart Mirror with AI virtual tailored service. This LG ThinQ mirror can deliver a customized experience with intelligent fashion suggestions and virtual fittings, enabling customers to purchase clothes without having to try them on in a store.